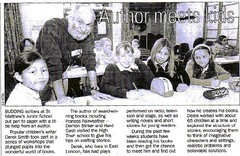 Lifted from Luton News of 4th May 2005. In true colour: these people really are blue. By the way, why has Melissa brought a toaster to school? Don't they feed her at home?